We’d love your help. Let us know what’s wrong with this preview of Mapping Manhattan by Becky Cooper. Armed with hundreds of blank maps she had painstakingly printed by hand, Becky Cooper walked Manhattan from end to end. Along her journey she met police officers, homeless people, fashion models, and senior citizens who had lived in Manhattan all their lives. She asked the strangers to “map their Manhattan” and to mail the personalized maps back to her. Soon, her P.O. bo Armed with hundreds of blank maps she had painstakingly printed by hand, Becky Cooper walked Manhattan from end to end. Along her journey she met police officers, homeless people, fashion models, and senior citizens who had lived in Manhattan all their lives. She asked the strangers to “map their Manhattan” and to mail the personalized maps back to her. Soon, her P.O. box was filled with a cartography of intimate narratives: past loves, lost homes, childhood memories, comical moments, and surprising confessions. A beautifully illustrated, PostSecret-style tribute to New York, Mapping Manhattan includes 75 maps from both anonymous mapmakers and notable New Yorkers, including Man on Wire aerialist Philippe Petit, New York Times wine critic Eric Asimov, Tony award-winning actor Harvey Fierstein, and many more. To ask other readers questions about Mapping Manhattan, please sign up. A beautiful object of a book, and a really interesting concept - the author spent a day walking the length of Broadway with her friend handing ordinary New Yorkers a uniform blank map of Manhattan, encouraging them to map their own experiences. Many different interpretations, some more engaging than others, but both the maps and the occasional added rationale makes this book a worthwhile read for anyone interested in the borough. Thank you to Barbara for her kind gift of this book! For all of us who've ever been in a relationship with that little island off the coast of America, this book is a tiny window into her other suitors' souls. I laughed. I cried. It was better than "Cats." I absolutely loved this book, what an awesome idea for a project. I read this with a post it note in the back where I jotted down things to include on my map of Manhattan, so many memories. So glad I bought it, and I highly recommend it to anyone who's been to NYC. Absolutely beautiful book - really makes you think about the places where memories are made and how location impacts what you think of a city as a whole. This was a book that although interesting to read, did not live up to my expectations. The concept seemed wonderful, but I felt that some of the maps chosen for the book were just OK. The book is printed in a small and narrow format, which I felt made it difficult at times to read all the handwriting on the maps. Though it was interesting to see what individuals decided to create with their blank maps, I guess I just had the idea that there would be more wild and elaborate maps. In general, I fel This was a book that although interesting to read, did not live up to my expectations. The concept seemed wonderful, but I felt that some of the maps chosen for the book were just OK. Awesome. It inspired me to map some of my life. 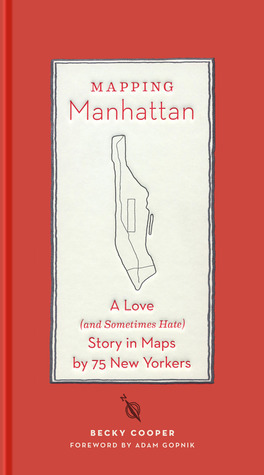 Entertaining and thought-provoking read for anyone interested in (as you may have guessed) maps, or Manhattan. These people and creativities and passions are why I love New York. A perfect, earnest book. Achingly beautiful, nostalgic project by a Harvard classmate. If you love maps, wandering, and the stories that stem from them half as much as I do, you will love this book. 9° de mis #librosen2018: "Mapping Manhattan", de Becky Cooper. Editado por Abrams Image en 2013. De paseo por el precioso barrio de Nolita encontré en una librería este otro Mapping Manhattan, un precioso proyecto de Becky Cooper encuadernado y editado con el gusto propio de una buena diseñadora que me ocupó la mayoría de las lecturas nocturnas. Durante varios meses Cooper recorrió Manhattan de norte a sur a través de la larguísima calle de Broadway pidiendo a los neoyo 9° de mis #librosen2018: "Mapping Manhattan", de Becky Cooper. Editado por Abrams Image en 2013. What happens when you walk the complete island of Manhattan and hand out hundreds of blank maps printed by hand to random New Yorkers asking them to write/draw/color any significant experience on the map? You get a beautiful treasure of a book that reads like secrets are being unfolded before ones very eyes. I never realized how maps can be used as a vehicle for creativity, storytelling, and self-discovery. This book is the ultimate tribute to New York and to the people who live there. This was fun, and the highlights were the celebrity contributions and the more professional artists. But the rest of the maps just show similar memories (this was my first apartment, this was my first Broadway show) from people we don't know. Really cute concept. Some of these maps are so imaginative. I have a large map of Manhattan that was given to me by my parents quite a long number of years ago now. The map is an early version (mid-19th Century) of the various planning maps that were creates at the time NYC went through the grid planning process, which gave the island its particular character for the next soon to be 200 years. This is a scaled down version of that - and a book that has the stories, hopes, dreams and losses of a number of folks who chose to participate in the author's idea. I'll give you a blank map of Manhattan and you draw/write you thoughts, impressions of the city on it. Some of the best were the simplest. and some I liked the most were about the upper reaches of the island. A book to read in pieces, to pick up from time to time to see what catches the eye, to sit and look at the maps and the drawings over them. The theme of a walk down the full length of Broadway, the street that so emphatically interrupts the clean structure of the grid and helped to ensure the city’s character. One can do the walk in the book or go out onto the street, only a block away, to follow the path for real. Stop. Take a moment. Think. Now draw the world around you. Not as it is, but as it is to you. This is the challenge Becky Cooper presented to hundreds of New Yorkers (and a few tourists, accidentally) with her brilliant art project, marching up Broadway armed with hand-printed maps for them to fill in any way they chose. The concept is amazing, and the maps frequently quite revealing, whether or not they come complete with the artist's name - chocked with kisses and first trysts, places to grab a Stop. Take a moment. Think. Now draw the world around you. Not as it is, but as it is to you. Per farsi venire nostalgia di New York e per trovare la scusa per comprare ancora libri di carta. I bought this book prior to visiting Manhattan for the first time in 40 years. I thought it would help put me in the right frame of mind before tackling such a huge, complex city. And did it ever!! I imagine that the future of hardcover printed books will be similar to this. It is not only a delightful project, but the physical design is so beautifully in keeping with its subject - proportioned to match the geography of the island, lovingly illustrated and the maps themselves so beautifully rende I bought this book prior to visiting Manhattan for the first time in 40 years. I thought it would help put me in the right frame of mind before tackling such a huge, complex city. And did it ever!! I think I ended up liking the concept of this more than the book. I found some of the maps hard to read, so that's kind of disappointing, but it was fun to read all those antidotes about my city and to read the maps of both strangers and some well known people. Unfortunately, I think I may have just expected more. Lovely, simple concept - get people to relate to their city, and share their passion for it, by giving them a very basic map and letting them mark/customise it as they deem fit. A good blend of the factual and the conceptual in the maps chosen, it conveys the magic that defines Manhattan. I could have cheerfully browsed through many more. This book was really cool. I am going back to visit NYC in a few months and this really ignited my excitement! Very fresh, creative book. I do wish there were more writings, but the maps are still fun. Maybe the writings are left out to let your imagination develop the stories more, but I like reading the people's actual stories along with the maps better. Still great! The maps were almost all too small to read on a Kindle. Somehow I thought this would be fun to read but it's really not too suitable for the casual tourist. Also the actual writing was minimal, with the focus in the hand-drawn maps. A beautiful book. Cooper asked New Yorkers to write and draw their own memories of their lives in New York onto a map of Manhattan. The results are often moving, sometimes disturbing. With an eloquent and incisive introduction by Adam Gopnik. Very fun. I enjoyed viewing all the maps and think it was truly a fabulous idea. I believe I can continue to look at them and find something new each time -- even though I need to find my magnifying glass for some of them. Enjoyed it. Makes me want to do it in Austin.